The festive season brings many wonderful gifts; time spent with loved ones, wonderful weather and special spoils and, of course, scrumptious food. At Camps Bay Retreat we’re all about spoiling each and every guest. That’s why we have put together a delectable Christmas lunch menu this year, meticulously curated to make you feel especially spoilt this Christmas. Join us on our beautiful grounds overlooking Camps Bay and the sparkling Atlantic this year for a scrumptious Christmas lunch. Our wonderful chefs have put together a menu that is sure to satisfy and leave you wanting more. You can expect Christmas classics such as grilled Turkey and Christmas pudding while also indulging in gourmet dishes such as Prosciutto wrapped scallops, baked Red Sea Bass and Mango cheesecake. 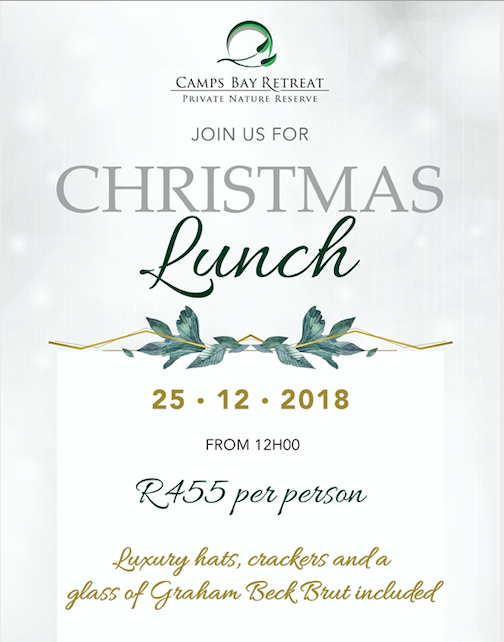 Camps Bay Retreat is a sanctuary for the soul and the perfect place to bring the family for a relaxed, classy Christmas lunch.